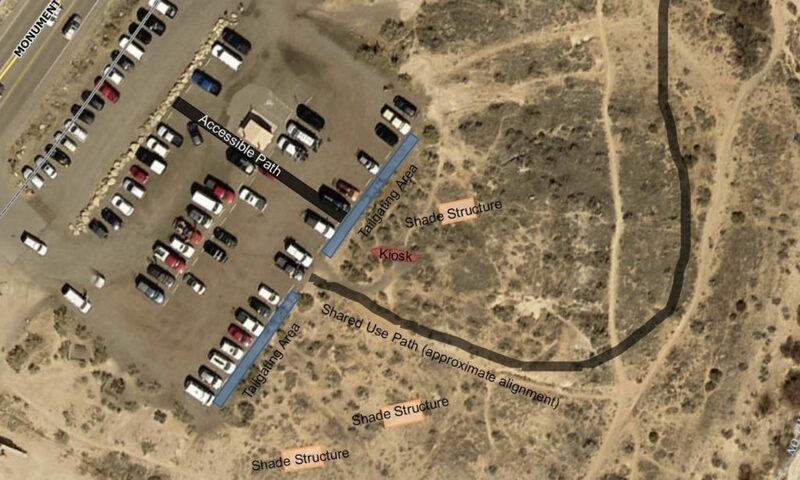 Help construct shade shelters for the Lunch Loop trailhead and continued work along the Monument Corridor! Join the Monument Mile campaign to raise funds for THRILL! (Trailhead Redesign and Improvements to Lunch Loop) and the next phase of construction for the paved trail that will connect the Lunch Loop Trailhead to the South Camp paved trail and the Redlands neighborhoods. In 2017, Colorado West Land Trust, the City of Grand Junction, Mesa County, and the Bureau of Land Management partnered to gather public input to determine desired improvements for the Lunch Loop Trail Network. In addition to a connection from the Colorado Riverfront Trail to the Lunch Loop area, many users suggested trailhead improvements to make it a safer, more welcoming environment. Arial view of the designed trailhead improvements. A design for the trailhead was recently completed and includes: the relocation of main trail access points, three shade structures, tailgate areas, and a new kiosk. Through a joint fundraising effort, the City of Grand Junction and Colorado West Land Trust have raised the funds for the construction of the paved trail and a few of the trailhead improvements. Colorado West Land Trust is now leading a community effort to raise the remaining funds—$40,000—to build three locally designed and constructed shade structures. 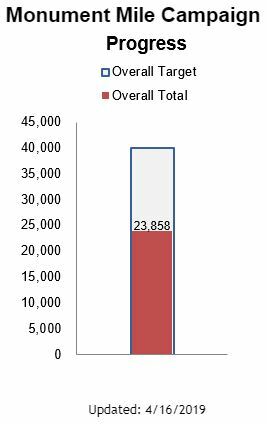 Special thanks to our Trailhead supporters to date (3/25/19)! Alpine Bank, Lions Club, REI, All Metals Welding, Mandy Harter/Remax, DT Swiss, Zach and Laken Eyler, Family Health West Hospital, Darin Kamstra, Michael Krieves, Jamie and Kristen Lummis, Eric Lusby, James and Susan Maclean, Jan Muyskens, No Coast Sushi, Redwood Financial, Linda Toth, Pamela and Malcolm Childers, Emily Farrington, Tim and Christy Fry, Harry and Joanie Griff, Will Hays, Gordon Nicholson, Paul Quimby, Charles Quimby and Susan Cushman, Richard Van Gytenbeek, and Ira and Roxanne Yates.